What is commonly called a coconut, as found in grocery stores, is actually only the single seed of a fruit of the coconut palm tree (Cocos nucifera). 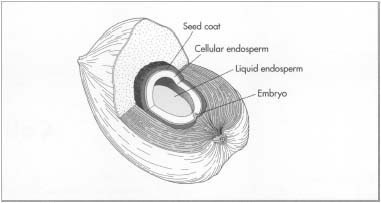 Before being shipped to market, the seed is stripped of an external leathery skin and a 2-3 in (5-8 cm) thick intermediate layer of fibrous pulp. Fibers recovered from that pulp are called coir. The fibers range from sturdy strands suitable for brush bristles to filaments that can be spun into coarse, durable yarn. In the United States, the most popular uses for coir are bristly door mats, agricultural twine, and geotextiles (blankets that are laid on bare soil to control erosion and promote the growth of protective ground covers). Although coconut palms grow throughout the world's tropical regions, the vast majority of the commercially produced coir comes from India and Sri Lanka. Coconuts are primarily a food crop. In India, which produces about one-fourth of the world's 55 billion coconuts each year, only 15% of the husk fibers are actually recovered for use. India annually produces about 309,000 short tons (280,000 metric tons) of coir fiber. Coir fibers are categorized in two ways. One distinction is based on whether they are recovered from ripe or immature coconut husks. The husks of fully ripened coconuts yield brown coir. Strong and highly resistant to abrasion, its method of processing also protects it from the damaging ultraviolet component of sunlight. Dark brown in color, it is used primarily in brushes, floor mats, and upholstery padding. On the other hand, white coir comes from the husks of coconuts harvested shortly before they ripen. Actually light brown or white in color, this fiber is softer and less strong than brown coir. It is usually spun into yarn, which may be woven into mats or twisted into twine or rope. The other method of categorization is based on fiber length. Both brown and white coir consist of fibers ranging in length from 4-12 in (10-30 cm). Those that are at least 8 in (20 cm) long are called bristle fiber. Shorter fibers, which are also finer in texture, are called mattress fiber. A 10-oz (300-g) coconut husk yields about 3 oz (80 g) of fiber, one-third of which is bristle fiber. The only natural fiber resistant to salt water, coir is used to make nets for shellfish harvesting and ropes for marine applications. Highly resistant to abrasion, coir fibers are used to make durable floor mats and brushes. Strong and nearly impervious to the weather, coir twine is the material hops growers in the United States prefer for tying their vines to supports. Coir is becoming a popular choice for making geotextiles because of its durability, eventual biodegrad-ability, ability to hold water, and hairy texture (which helps it cling to seeds and soil). The inside layers of the fruit from a coconut palm. the tropics either naturally or by human travel and trade. About A.D. 60, a Greek sailor wrote about a coconut-producing East African village, probably on the coast of present-day Tanzania, whose boats were made of planks sewn together with fibers. By the eleventh century, Arab traders (whose route stretched from China to Madagascar off the southeastern shore of Africa) were teaching residents of what are now Sri Lanka and India how to extract and process coconut fibers. During the thirteenth century, Marco Polo—while visiting the port of Hormuz on the Persian Gulf—discovered that the masterful Arab seamen built their ships without nails, sewing them together with coconut fiber. In China, Polo found that the Chinese had been using coconut fiber for 500 years. Halfway around the world, coir also played a significant role in the exploration of Micronesia and Polynesia, where the product is commonly called sennit. For example, early settlers of Hawaii arrived from the Marquesas Islands around the fifth century in a large, double-hulled canoe lashed together with coconut fiber. In fact, sennit lashings were the primary mechanism for connecting pieces to construct boats, buildings, weapons, and tools until European explorers brought iron nails to the region in the late eighteenth century. Coir production changed little until efforts to mechanize it began in the middle of the twentieth century. In India, a defibering machine was invented in 1950. Coir processing is an important economic activity in India, where it provides jobs for more than 500,000 people. Because mechanization would eliminate a significant number of those jobs, it is being introduced gradually. In 1980, the primary producing countries of India and Sri Lanka began an ongoing effort to identify and correct technological limitations on coir production. In Europe and Asia, brown coir mats may be sprayed with latex rubber for use as padding in mattresses or automobile upholstery. The outer layers covering the coconut seed are processed and spun into fibers commonly known as coir. 2 Ripe coconuts are husked immediately, but unripe coconuts may be seasoned for a month by spreading them in a single layer on the ground and keeping them dry. To remove the fruit from the seed, the coconut is impaled on a steel-tipped spike to split the husk. The pulp layer is easily peeled off. A skilled husker can manually split and peel about 2,000 coconuts per day. Modern husking machines can process 2,000 coconuts per hour. 3 For freshwater retting, ripe husks are buried in pits dug along riverbanks, immersed in water-filled concrete tanks, or suspended by nets in a river and weighted to keep them submerged. The husks typically soak at least six months. 4 For saltwater retting, green husks are soaked in seawater or artificially salinated fresh water. Often this is accomplished by placing them in pits along riverbanks near the ocean, where tidal action alternately covers them with sea water and rinses them with river water. Saltwater retting usually takes eight to 10 months, although adding the proper bacteria to the water can shorten the retting period to a few days. 5 Mechanical techniques have recently been developed to hasten or eliminate retting. Ripe husks can be processed in crushing machines after being retted for only seven to 10 days. Immature husks can be dry milled without any retting. After passing through the crushing machine, these green husks need only be dampened with water or soaked one to two days before proceeding to the defibering step. Dry milling produces only mattress fiber. 6 Traditionally, workers beat the retted pulp with wooden mallets to separate the fibers from the pith and the outer skin. In recent years, motorized machines have been developed with flat beater arms operating inside steel drums. Separation of the bristle fibers is accomplished by hand or in a machine consisting of a rotating drum fitted with steel spikes. 8 The clean fibers are spread loosely on the ground to dry in the sun. 9 Bristle fibers that will not immediately be further processed are rolled and tied into loose bundles for storage or shipment. More mechanized producers may use a hydraulic press to create compact bales. 10 Similarly, mattress fibers may simply be baled with a hydraulic press. However, if more processing is desired, the fibers are combed with mechanical or manual carding tools, then loosely twisted into a thick yarn (wick), and wound into bundles. Later, the wick can be re-spun into a finer yarn. Techniques vary from simple hand spinning to use of a hand-operated spinning wheel or a fully automated spinning machine. 11 Depending on its intended final use, the yarn may be shipped to customers, or multiple strands may be twisted into twine and bundled for shipment. Both traditional manual techniques and newer mechanical methods are used to braid twine into rope and to weave yarn into mats or nets. 12 For some uses, such as upholstery padding, bristle fiber is loosely spun into yarn and allowed to rest. Then the fibers, which have become curly, are separated. These fibers are lightly felted into mats that are sprayed with latex rubber, dried, and vulcanized (heat treated with sulphur). By weight, coir fibers account for about one-third of the coconut pulp. The other two-thirds, the coir pith (also known as coir dust), has generally been considered a useless waste material. Although it is biodegradable, it takes 20 years to decompose. Millions of tons sit in huge piles in India and Sri Lanka. During the last half of the 1980s, researchers successfully developed processes to transform coir pith into a mulching, soil treatment, and hydroponic (without soil) growth medium that is used as an alternative to such materials as peat moss and vermiculite. Before being compressed into briquettes for sale, the coir pith is partially decomposed through the action of certain microbes and fungi. An Australian company has also recently begun turning coir pith into an absorbent product used to remediate oil spills. The retting process used in coir fiber production generates significant water pollution. Among the major organic pollutants are pectin, pectosan, fat, tannin, toxic polyphenols, and several types of bacteria including salmonella. Scientists are experimenting with treatment options, and at least one coir manufacturing company claims to be treating its effluent water. As improved technology increases production, industry groups and governmental agencies are actively promoting new uses for coir fiber. Geotextiles is one promising area. The Indian state of Kerala designated 2000 as Coir Geotextiles Year, which it observed by increasing marketing efforts and supporting research to improve production. The annual world demand for geotextiles is 1.2 billion square yards (1 billion square meters) and growing. Although natural fibers account for only 5% of that, the proportion is expected to increase as more users turn away from nonbiodegradable synthetics. Another new product under development is an alternative to plywood that is made by impregnating a coir mat with phenol formaldehyde resin and curing it under heat and pressure. Fremond, Yan. The Coconut Palm. Berne: International Potash Institute, 1968. Kew Royal Botanic Gardens. http://www.rbgkew.org.uk/ksheets/coir.html (October 2000). Punchihewa, P.G., and R.N. Arancon. "Coconut." In Post-Harvest Operations Compendium. Food and Agriculture Organization of the United Nations (FAO). 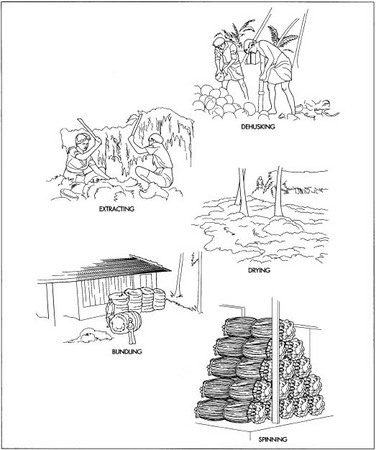 http://www.fao.org/inpho/compend/text/ch15.htm (November 2000). Sudhira, H.S., and Ann Jacob. &ldqo;Reuse of By-Products in Coir Industry: A Case Study." Internet Conference on Material Flow Analysis of Integrated Bio-Systems (March-October 2000). http://www.ias.unu.edu/proceedings/icibs/ic-mfa/jacob/paper.html (October 2000).